May | 2013 | Scrap the MAP! 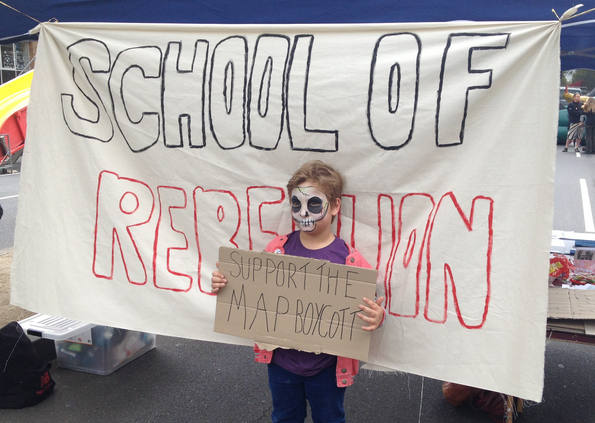 MAP test boycott victory for High Schools! Banda was referring to the controversial Measure of Academic Progress (MAP), which has been boycotted by teachers in several Seattle high schools since January because of the deep flaws in the test, which is not aligned with the school curriculum and was brought to Seattle Public Schools through what a state investigator found was a conflict of interest. 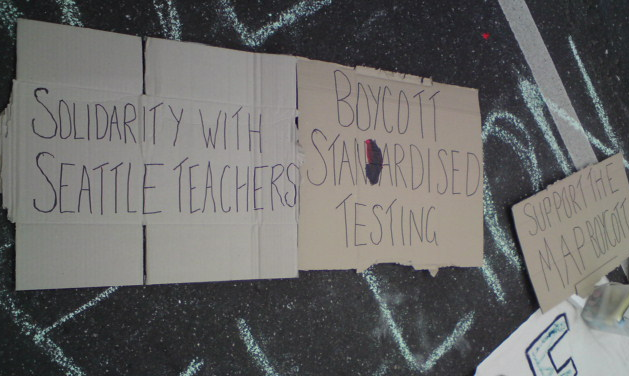 The boycott gave a boost to the national movement against the overuse of standardized tests, with support from across the U.S. and even abroad. The announcement of this victory over the MAP test led to spontaneous celebrations at Garfield High School as students and teachers traded high fives, fist-bumps in the hallways. Until now, the “Measures of Academic Progress” (or MAP) tests were required by the Seattle School District for students in all grades (K-12). A unified group of Garfield teachers announced in January, 2013, however, they were no longer going to administer the tests to students at Garfield. The Garfield PTSA quickly endorsed the effort, as did the student body. Four other Seattle high schools followed suit–Chief Sealth, Center School, Ballard, and Ingraham–and the bravery of these teachers led to a national movement. Even the University of Washington’s chapter of the American Association of University Professors endorsed the teachers’ boycott. MAP tests are sold by a national company, the Northwest Evaluation Association, which has not properly aligned them with student curriculum. Seattle School District staff have acknowledged that the test is not valid at the high school level because the margin of error is higher than the expected gains. The test is not properly aligned to the curriculum. Former Superintendent, the late Maria Goodloe-Johnson, brought the MAP to Seattle at a cost of some $4 million while she was serving on the board of the company that sells it. The state auditor called this an ethics violation because she did not disclose it until after the district approved the company’s contract. This test especially hurts students receiving extra academic support — English-language learners and those enrolled in special education. These are the kids who lose the most each time they waste five hours on the test. Computer labs are commandeered for weeks when the MAP is administered, so students working on research projects can’t use them. Students without home computers are hurt the most. One of the great outcomes of the MAP test boycott has been the formation of the Teacher Work Group on Assessment that gathered some 20 educators from around Seattle to research testing and develop criteria for what should replace the MAP test. Part of Superintendent Banda’s decision on the MAP test for next year states that schools will need to develop their own assessments to replace the MAP and this document provides the guidelines to do just that. The document, titled, Teacher Work Group on Assessment Recommendations, Spring 2013, concluded that standardized tests have many flaws and that the MAP test should be replaced by assessments that: 1) reflect of actual knowledge and learning, not just test taking skills; 2) Are educational in and of themselves; 3) Are free of gender, class, and racial bias; 4) Are differentiated to meet students’ needs; 5) Allow opportunities to go back and improve; 6) Undergo regular evaluation and revision by educators. Praise is due for the Garfield High School Parent Teacher Student Association (PTSA, the parent-run body of the school) for their unanimous vote to support the MAP test boycott. PTSA President Phil Sherburne’s visionary leadership proved decisive in our victory for quality assessment. Moreover, we thank the hundreds of parents who made the educated decision to opt their student out of the test and refused to have their child’s complex intellectual process reduced to a single number. The students who held meetings, wrote poems, and distributed flyers against the MAP test showed great ingenuity and critical thinking skills. Their independent decision to refuse to take the test by the hundreds was critical to this victory over the MAP test. The dozens of prominent educators who supported our struggle provided the analysis that helped our boycott gain a wider hearing. Jonathan Kozol, Diane Ravitch, Karen Lewis, Nancy Paige-Carlson, Lois Weiner, Brian Jones, and Wayne Au all provided critical support. 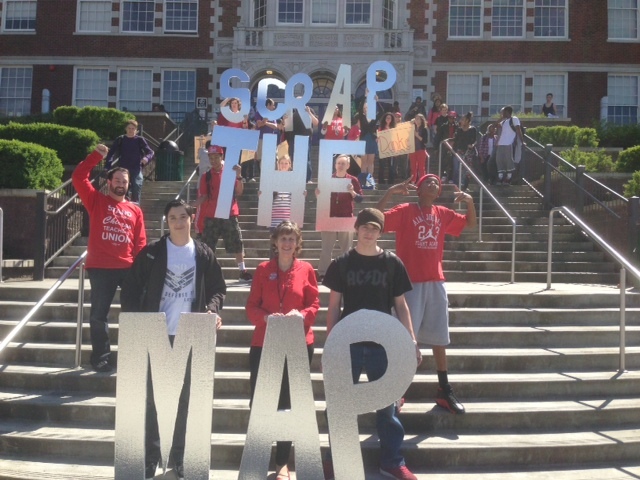 The Scrap The MAP committee would like to thank the members and Association Representatives of the Seattle Education Association (the teacher’s union) for their support, passion, and dedication to supporting the boycotting teachers. The old labor song that goes, “The union makes us strong” was proven once again. We would also like to thank SEA President Jonathan Knapp for attending our negotiating sessions with the Seattle School District Superintendent Jose Banda and allowing the boycotting teachers the space to take the lead in those discussions. We want to thank National Education Association President Dennis Van Roekel for his written support of our boycott and for his call to our rally to inspire our teachers. His words gave courage to teachers who were facing great odds. As well, American Federation of Teachers President Randi Weingarten’s support for our boycott was indispensable and a truly powerful showing of solidarity. 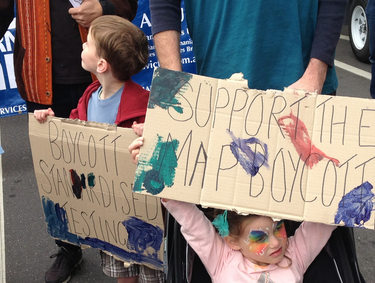 The Washington Education Association’s vocal support and publicity of our boycott helped keep educators around the state stay informed of how they could help. We also want to thank all the teachers and their unions around the world that supported our boycott, including the Japanese Education Workers Caucus, British Columbia Teachers’ Federation, and the United Kingdom’s National Union of Teachers. The support of education organizations who have been struggling for quality assessments for years was especially appreciated. The Seattle chapter of the NAACP, Rethinking Schools, Fair Test, The Zinn Education Project were all vital to building solidarity to our struggle around the city and the nation. 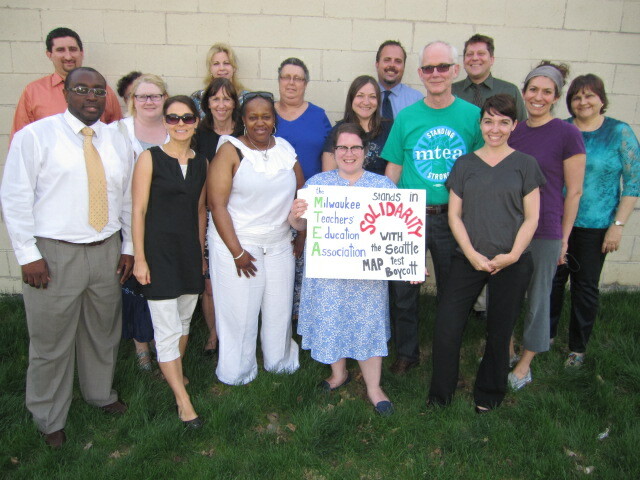 WASHINGTON – May 16, 2013 – A mismatched standardized test administered in Washington state that sparked local boycotts involving educators, parents, and students and intensified the national spotlight on the need for high quality assessments is no longer mandatory in Seattle-area high schools after this spring. Seattle Public Schools Superintendent Jose Banda announced the district’s decision regarding the Measures of Academic Progress (MAP) test yesterday in a letter to school administrators. In the letter, Banda states high schools can decide not to administer the test. The boycott of the test drew national coverage as many districts and states struggle to effectively assess student achievement. “These brave teachers knew the MAP test wasn’t the best tool to track high school students’ progress in this instance, and they fought hard to get heard. Now the district and its educators can join forces to implement assessments that work for all involved: students, teachers, and parents,” said Van Roekel. See EducationVotes.org coverage of the Seattle testing boycott here. Join the conversation on Twitter using #scrapthemap and #EducationSpring. Follow us on twitter at twitter.com/NEAMedia. 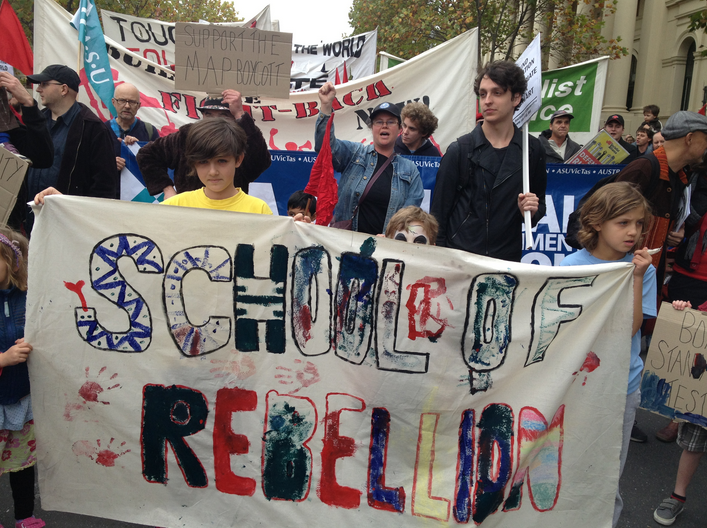 On behalf of The School of Rebellion in Melbourne, Australia I am writing to extend our solidarity to the teachers of Seattle fighting against the beast that is standardised testing. Here in Australia we know all to well about the detrimental effects that standardised testing and teaching to the test has our students education and our working conditions. 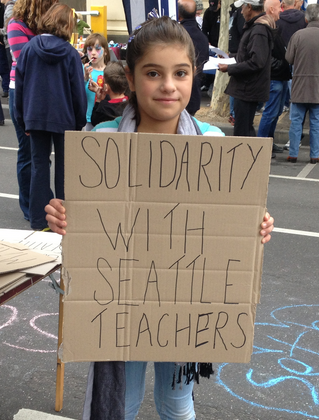 Please find photos from our recent May Day rally attached taken in solidarity and support with the Seattle Teachers leading the way in the boycott of standardised testing.